All instructors for this program must be pre-approved to deliver the class. 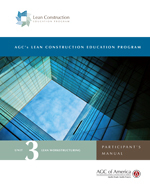 Visit www.agc.org/LCEP for details. This Instructor's Guide contains a copy of the corresponding Participant's Manual.